Tianjin is a bright pearl in northern China. 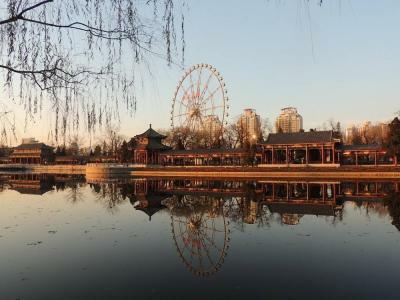 With excellent geographical location and traffic conditions, Tianjin has become an important hub for connecting both home and abroad. Tianjin Port is the largest bonded port area in China and the largest cruise homeport in Asia. Tianjin has a lot of European architecture, and the scenery is good, the huangya Pass Great Wall, Italian Style Street and Five Great Avenues are worth for a visit. The unique traditional food in Tianjin is also impressive. 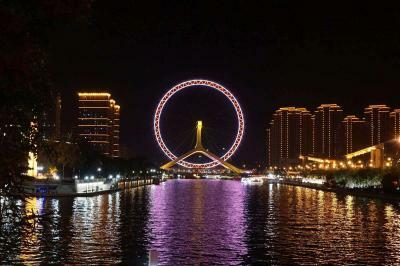 The Eye of Tianjin is a ferris wheel across the Haihe River, like an eye on the bridge. 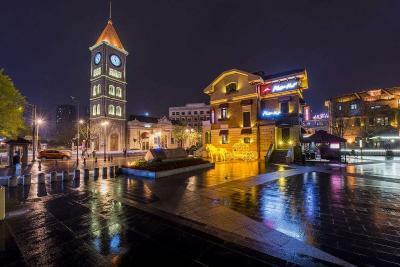 It is one of the most famous landmarks in Tianjin. The ferris wheel is driven by electricity and has 48 passenger capsules. Each capsule is able to carry eight passengers for a half hour rotation. Every night the colorful lamps of the Eye of Tianjin will attract numerous visitors for sightseeing and photo shooting, enjoying a different kind of romance. How to get here: Take bus No.1, 4, 12, 18, 34, 609, 610, 611, 619, 632, 641, 646, 659, 670, 671, 818, 878 and 904, get off at Jingang Bridge Stop; or take bus No. 5, 37, 161, 606, 635, 642, 653, 657, 658, 687, 801, 824, 836, 855 and 906, get off at Beidaguan Stop. 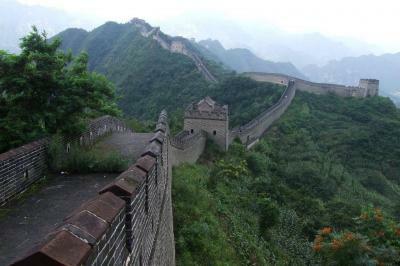 HuangYa Pass Great Wall is steep and spectacular. It is a good place for weekend vacations with many farmhouses nearby for food and accommodation. You can enjoy the farm dishes, breathe the fresh air, and can enjoy the authentic rural life. 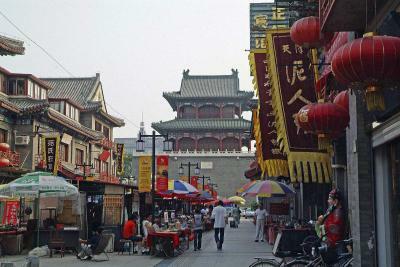 Ancient Culture Street is the concentration of the most famous old shops and handicraft shops. You can find the Yangliuqing New Year Paintings, clay figurines, Wei’s Kite and many other handicraft shops, and you can enjoy the classic Goubuli buns, Chinese hamburgers, fried dough twists and other Tianjin cuisine. In addition, the annual Chinese lunar month March 23 is the birthday of the goddess of the sea. At the time, the Ancient Culture Street will hold the empire fair with cultural performances. How to get here: Take bus No.52 to huanghedao Stop; or take bus No.856 to Dongmalu Stop. Five Great Avenues is the combination of more than 20 distinctive streets. You can take a glimpse of more than 2000 garden-style European-style buildings, including more than 300 former residences of celebrities. You can take a map to guide your visit, and you can take a horse-drawn carriage or ride a bike. How to get here: Take metro line No.1 to Xiaobailou Station; or take bus No.9, 13, 800, 831, 902, 904 and 906. 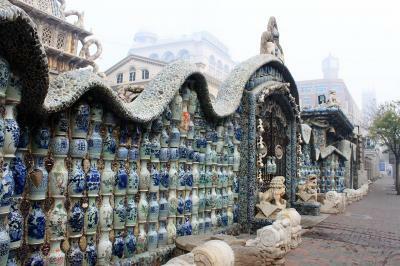 Porcelain House is a French architecture decorated by countless ancient porcelain, white marble stone, crystal and agate. The wall, courtyard and rooms are all filled with exquisite ancient Chinese porcelain and antiques. If you are the first time visiting the Porcelain House, the overwhelming porcelain antiques will make you dazzle. How to get here: Take metro line No.3 to Heping Road Station, go out through exit E, and walk south for 250m. If you want to go by bus, take bus No. 1, 4, 9, 20, 35, 50, 97, 611, 619, 650,693, 808, 831, 828, 845, 851, 860, 901, 902, 904, 951 and 962 to Bohai Building Stop or Shandong Road Stop. Italian Style Street has more than 200 elegant Mediterranean style buildings. Walking around as if you are in the romantic European town. At night, the restaurants, cafes and bars become lively, making a charming atmosphere on the Italian Style Street. 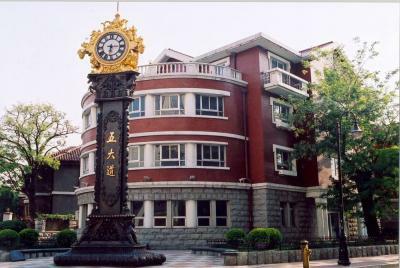 How to get here: Take metro line No.2 to Jianguo Avenue Station. Take bus No. 5, 8, 27, 324, 634, 635, 638, 639, 645, 663, 676, 802, 806, 832, 836, 905 and 961 to Italian Style Street Stop. 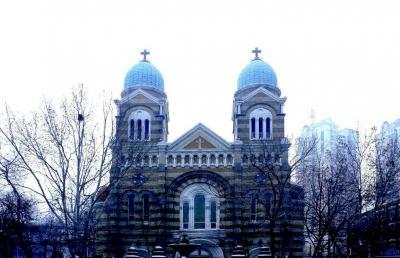 Xikai Church is a Catholic Church founded in 1917. The church architectural style is solemn and the sculpture are complicated and beautifully. You can participate in the mass and Catholic festivals to feel a religious atmosphere. How to get here: Take bus No.3, 35, 45, 50, 600, 643, 673, 800, 847,851 and 901. The Water Park is the largest comprehensive park in Tianjin. The park consists of three large lakes and eleven islands, with trees, pond, and Japanese and Chinese style landscapes. It also has cruise ship, ferris wheel, roller coaster and other entertainments for you to explore. How to get here: Take metro line No.3 to Zhou Enlai and Deng Yingchao Memonal Hall Station. Take bus No. 12, 35, 52, 643, 705 west line, 608, 668, 685, 835, 857, 871, 872, 879, 901, 963. 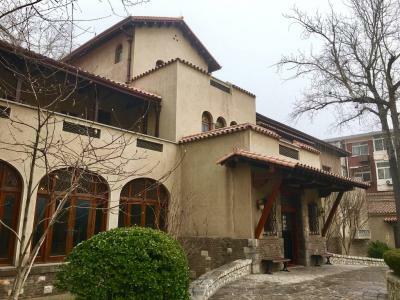 Tianjin Former Residence of Puyi was built in 1921, covers an area of about 3000 square meters. From July 1929 to November 1931, Pu Yi, the last emperor of China, used to live here with his Queen, and he named the garden as "Jingyuan", which means “Quiet Garden”. The buildings in the garden combine Spanish and Japanese style. The garden also has the Pu Yi Exhibition Hall, exhibiting hundreds of precious pictures on Pu Yi. If you are a fan of the famous movie "The Last Emperor", this site will be highly recommended. How to get here: Take bus No. 3, 50, 600, 606, 631, 632, 643, 657, 673, 840, 850, 851, 865, 867, 870 and 906 to Anshan Road Stop. 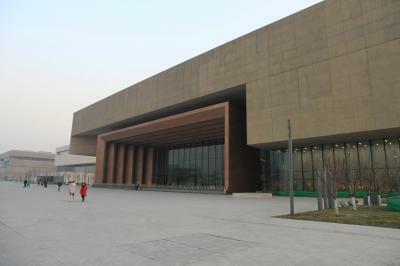 Tianjin Museum collects Chinese ancient works of art and modern history literature. Until now, the museum has nearly 200,000 objects, including ancient bronze wares, ceramics, calligraphy, painting, jade wares, royal seals, stationery accessories, oracle bones, currency, stamps, Dunhuang literature, local folk crafts, historical literature, etc. How to get here: Take bus No. 47, 662, 668, 686, 800, 835, 868 and 912 to Tianjin Museum Stop.